When Pamela started having children and looking after her family she forgot about herself. Her wake-up call came when she saw a picture of herself at 50 and did not recognise that woman. A lot has changed since then and through her weekly ‘I Matter’ campaign on her blog and other writings she is inspiring other women not to make that same mistake. Let’s discover more about her process of rediscovery and her unique style! 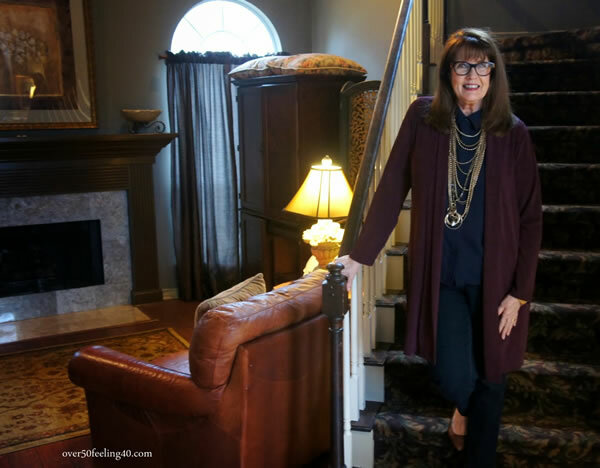 I teach high school journalism (for 15 years)…am a professional blogger…a freelance writer (two monthly publications)…a mom of three adults…a wife…and grandmother to two handsome boys! I live in San Antonio, TX and am a born and raised Texan! I am now 61 years old! I do consider myself to be in the over 50 group of wonderful Baby Boomers who are living longer than most generations before. Can you tell us a bit more about your blog Over 50 feeling 40 and why you created it? I married at age 31 and began to have children later in life. As I gained weight and became overwhelmed with parenting, I moved my personal care to the bottom of the priority list. I had family members who began to speak very ugly to me about my appearance and this only made it more difficult to stay positive. So, I just gave up taking care of Pam. When I had to renew my driver’s license at age 50, it was the picture which became an “Ah, Ha” moment in my life. I looked at that woman and did not know her. Where had I gone? The loss of a few good friends around that same time had awakened me to the fact that LIFE IS SHORT. So, I began a personal makeover from the inside to the outside and took my life back. I put depression and negative feelings in my past and decided to wear a smile and confidence every day. After five years, I began to share all I had learned with friends and my BFF at the time, Gail, said, YOU NEED TO START A BLOG. That was right at five years ago…I started a blog over50feeling40 and been amazed at all that has happened since then. You talk a lot about the I Matter campaign. Can you tell us a little bit more about it and why this is so important to you? Because of the story I just told you, I realized how many women are like I was at that time…shut down and defeated. We all tend to put ourselves at the bottom of the priority list at certain times of our lives. Realizing I MATTER and taking back my own life was empowering to me. I could do more for others if I took care of myself and I was more joyful. So, I MATTER day on my blog (now Thursdays) specifically celebrates this message in an effort to encourage those who need to get out of the doldrums and live again. It is not a selfish message at all, but an important one encouraging all of us to take care of ourselves in healthy ways. Looking and feeling our best really does release us to do more. I also hope I MATTER will reach to young mothers who may be letting go of themselves while they go through the childcare years. You do not have to waste the time I did…learn it early! How have the changes you made in terms of appearance and self care changed you? So much has changed since I began to care for me. Once I started to dress better with the current body I had, I was also able to finally lose weight. I could see the potential then and the desire increased to look and feel better. I had courage to start later in life and not give up. I started weight training right before I turned 60 and have kept it going. I started the Jenny Craig diet last summer and have presently lost 25 pounds. I became more confident that I could reinvent my career life at this age…and I have. I smile more…laugh more…and enjoy each day to its fullest. It is funny, but during depressed times we actually focus more on ourselves. Breaking out, has been so freeing. I enjoy others so much more now. It has made a huge difference in my life and my health. I am not afraid of my osteoporosis because I care for myself. I am not afraid of what turning sixty means to so many…I am not old…I am enjoying life more right now than I ever have! I like to say I am classic with a creative twist! I believe the most important word when developing personal style is COMMUNICATION. What are you communicating with the clothes you put on every day? I want to communicate that I am strong, confident, in-charge, joyful and creative. I try to take the time to ask myself in the mirror every day…am I communicating these five words. Living in South Texas means that I am in a warm climate most of the year. I love winter clothes but do not wear them often so my investment in them is going to be small. I try to look for separates, more than dresses, which will work for multi-seasons. Also, San Antonio is a multi-cultural city with a strong Hispanic majority, so there is color everywhere. I do believe it has fueled my love of color. I am not sure if I do…it is important to me that I know Pam-Style. Right now, at this moment I am more confident about my style than any other time of my life. It takes time to develop your style, but it is worth it to stick with the journey. I have been known in the past as the Scarf lady at my school, but I have gravitated to other accessories now and I always accessorize. I read many blogs and magazines and I receive inspiration from others and keep an inspiration file. I love neutrals as a base and will build around many neutral outfits. 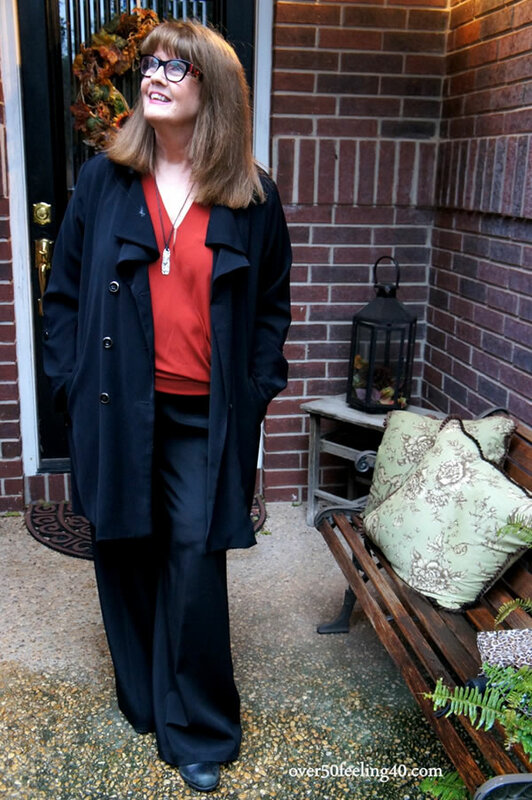 I always want to look like I am a CEO when I dress for work…yes, even working in a high school…you just never know what will happen or who you will run into. DRESS FOR THE JOB YOU WANT is always in my mind. When I go to Fashion Events, I like to test the waters with more creativity. 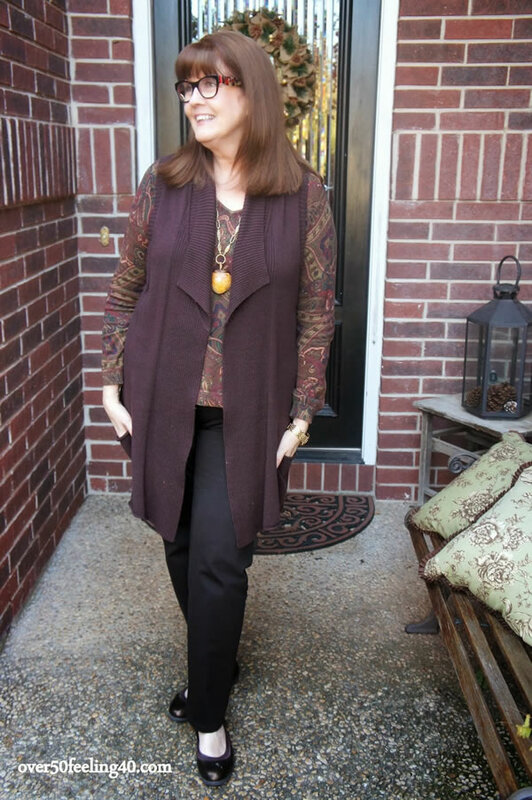 I never want to look like what many think sixty year olds look like…I do not want to be frumpy…or CUTE. I want to be fabulous every day. I try my best to look great when I run errands during non-work times…again, you just never know who you will meet. I think we all have to take our best colors and our body type into account for the most flattering looks. I look my best in saturated, deep jewel tone colors…so I wear those the most. I am a curvy gal and so there are styles which will flatter my body the best and are slimming. I love an elongated look as well, and I use those tips. 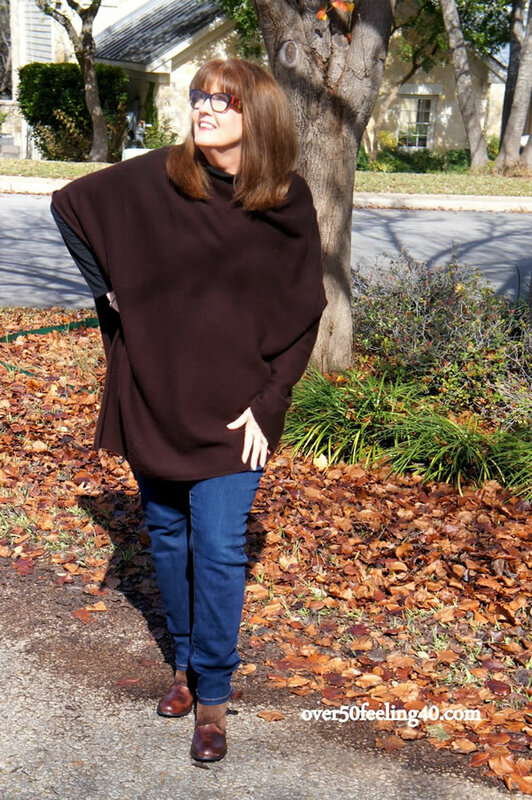 I really rarely wear heels any longer (aging feet) so I need other ways to elongate my style. I never think about my age when trying on clothes. I think about my adjectives and what I am communicating. I am careful with prints, lace, and especially florals, because they especially will make me feel older with some designs. It is up to each individual woman what they deem appropriate. I do not wear mini-skirts because they are not good for my body type. I know some over 50 women who wear them well. Women over 40 should not shop in junior departments because of fit and quality…not because they are for kids. Bottom line: What do you want to say with your clothes? Who do you want to attract? What do you want to accomplish? Those are the questions…not how old should I be to wear this or stop wearing this? Well, I loved fashion in my 20s and early 30s…then I went through my years of struggle with who I was …now, I am back. I love fashion…its creativity and fun. Fashion and style are transformative and empowering for women…that is what is important at my time of life. I want to experience the joy each and every moment. I really am having the most fun now…because this stage of life comes with lessons learned, freedom, and really less stress. Fashion and style are transformative and empowering for women…that is what is important at my time of life. I show respect for myself with how I look. When I see a healthy, well styled woman in the mirror, I have the confidence to go out and tackle anything. I am not trying to look younger…I want to look good every day and exude joy. The best accessory we wear is a smile. Tough question as this changes daily but here are a few favorites. 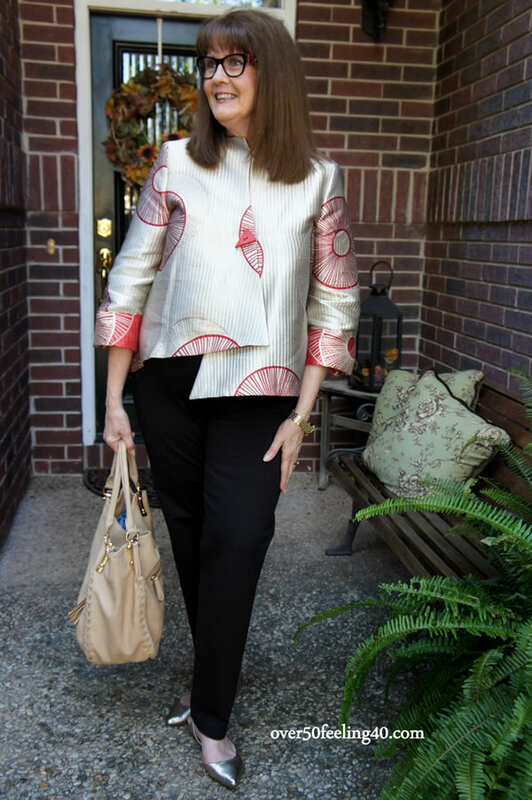 The oriental jacket – such a great fit and a good example of trying things on even if it is out of your normal style or comfort zone) I was featured in the local newspaper in this outfit because our Style Writer saw me and wanted to take feature me in a Street Style Column he does. This black outfit – represents what I wear often. I love black and do wear it often…now even in warmer weather. I use trends as inspiration and guidelines to mix up my look and have fun with fashion. I am not going to purchase something just because it is on trend, but at my age, you see trends come and go a lot. This spring there are many colors called Spice Market colors, and Marsala (color of the year) which are deeper, richer colors with brown foundations and these are MY colors. I love them and will wear them during the warm weather this year and be on trend. I also love all of the longer jackets and dusters around this year and some of the boho-prints which I can do on a small basis but not in an overall look. Decide five adjectives you wish to communicate with your style and stick to them…that way over time you develop a strong message and a personal style. Always try clothes on and take time to shop. Mistakes are often made with quick decisions. Less is more. Do not pile on the accessories or heavy prints. You do not have to spend a lot…there are great pieces at every price point. Take time to shop. Wear what makes you feel great…wear clothes which cause you to walk into every room with your head held high. 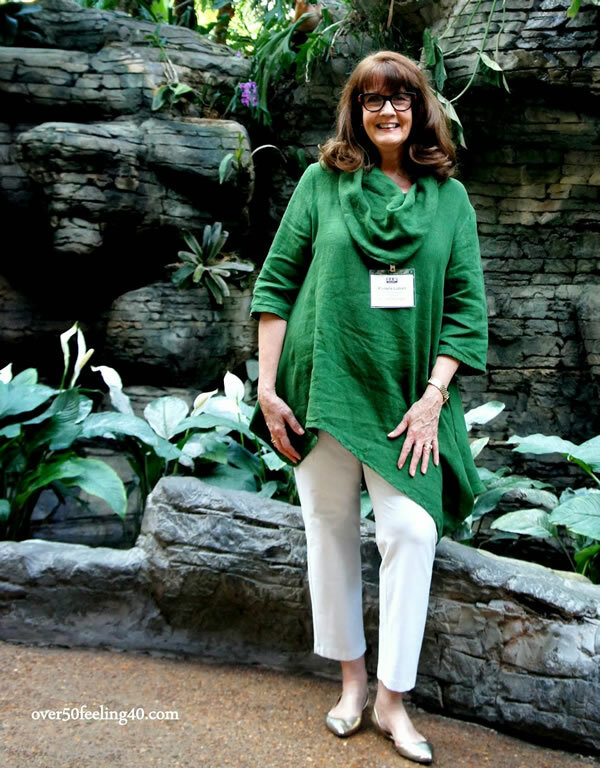 I just returned from the first national blogging conference just for mid-life bloggers, Called BAM. I am energized and ready to begin video and write a book soon. Over the years? Sure, I would love to be the Betty White of bloggers and do this for the next 30 years. We will see…anything is possible. Life is short. Enjoy each moment and smile. Do something which brings you personal fulfillment and joy. Then you can help others more. Lots of food for thought and great tips! 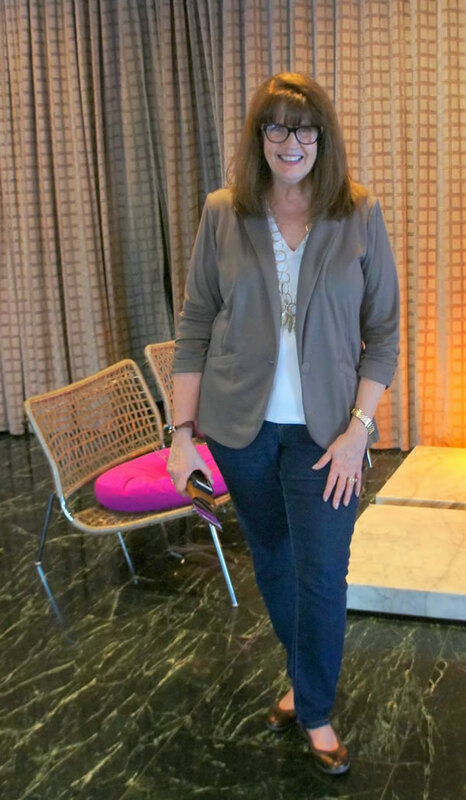 If you want more, be sure to visit Pamela’s blog: Over 50, feeling 40! Which outfit of Pamela is your favorite? I adore the oriental jacket. And Pamela is exuding so much happiness with her smiling face. I like her attitude! 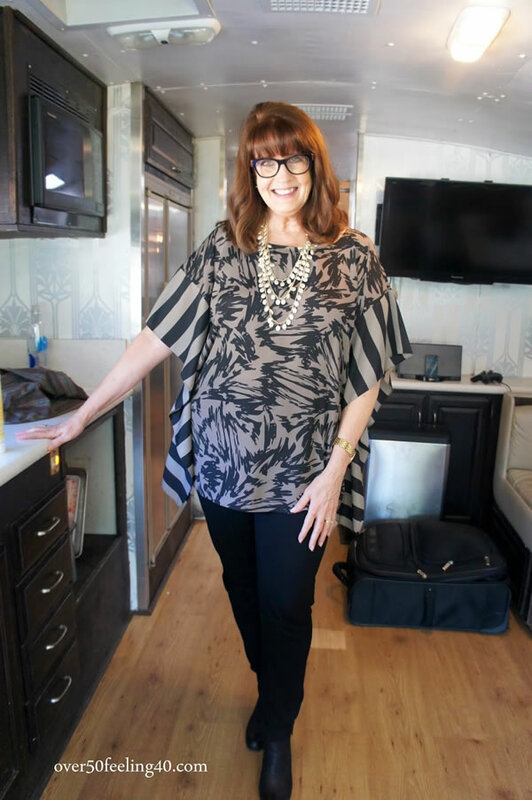 Pam is a fabulous woman – she’s one of the first bloggers I discovered, and I still follow her daily. Great interview! Love the Silver Oriental Jacket with the fans. Where could it be purchased? Thanks for this great interview Sylvia. Lovely to see her featured here along with her story. I love all of her coats but the Asian styled coat that is white with the red circles is my favorite. She looks great in all these pictures. I also LOVE that silver oriental coat with the red trim. It is super on her! I had exactly the same “Who IS that?” moment as Pamela did, only mine was a year after I had my son at 43. I was so busy being Mommy that I forgot about me. Sometimes it is hard for women to find the trail back to Style after being lost in a sea of sweatpants and diapers! Wow, Sylvia…thank you …this is so great. And thanks to all of the sweet comments. For those asking about the oriental jacket. It is a brand at Dillards called IC Collection by Ivanka Trump. If you do not have a store in your area, you can go to Dillards online. I love this jacket and it usually brings the same response as readers have here. So glad I purchased it to wear for San Antonio Fashion Week. I have worn it so many other places. Thank you again for everything. I have been following Pam for quite some time now. She is indeed very energetic and courageous. I love her in that silver/red jacket. So nice, especially with the silver shoes. And I also like her leopard jacket, and the green big sweater and the cream/beige loose jacket. All great items. What a cool and inspiring woman! I’m nearly 49 and I still struggle to find out what my style really is. Reading about Pamela really inspires me, and I’m sure her advices will be a huge help for me finding my style in the future – thanks a lot! 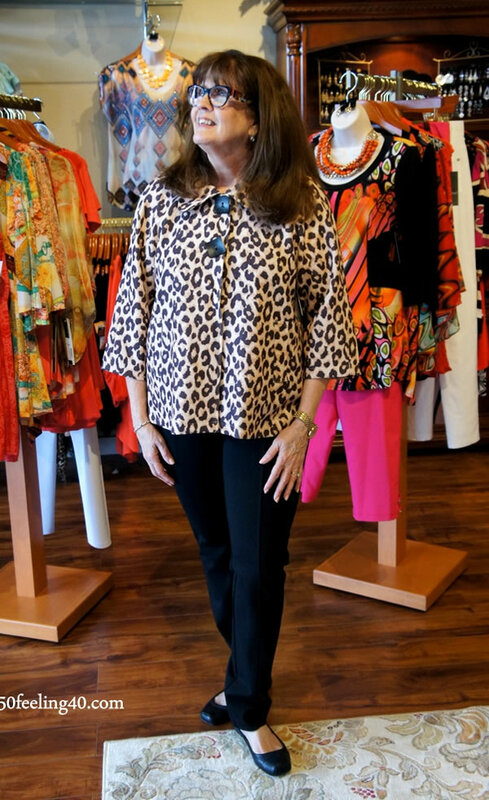 I simply LOVE the leo jacket and the black pants – so cool and sophisticated. Could you tell me where I might find the oriental jacket? It is gorgeous. Pam looks stunning in all of the photos. My favorite is the oriental jacket. Pam is such a kind and special lady , someone i’d enjoy knowing in real life. Her message is so important for women in our age group to see and hear. Last night I was looking on Google images of picture references of mid aged women. It made me sad to see negative images of our age group. Pam’s positive outlook is refreshing and so needed! Enjoyed reading the background of her blogging. I love this feature, what an inspiration. I’ve been trying to people please and been on this quest to change. I’m on my way. Thanks Sylvia. Great and inspiring article. So wonderful that she is speaking out about this thing that happens to so many women. I am 100% certain that if there was a rash of men putting themselves last as women do, there would be some sort of nationally-funded support centre. I love the asian jacket also! You have a wonderful style. One suggestion: ditch the brown! It really washes you out. I’d recommend you put loads more color into your wardrobe! Previous post: How to mix high-end with low-end and old with new! 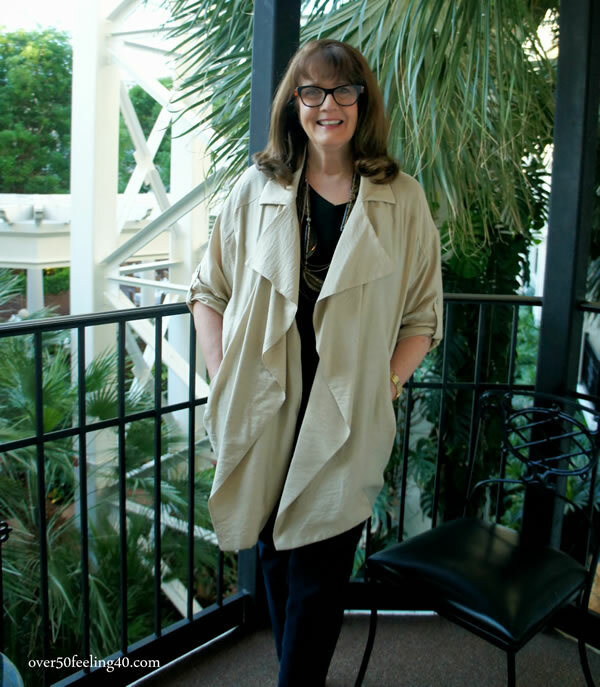 Next post: Brand focus: Eileen Fisher – the best of their spring 2015 collection!